WFP strives to reach all those affected by the Mosul crisis in Iraq. Despite opening more camps, thousands of families remain in need of urgent care and food assistance. WFP is providing ready-to-eat rations to families, including supplying families of five with a month’s worth of staple foods, including rice, wheat flour, chickpeas, vegetable oil, sugar and salt. The struggle of the families to find decent living conditions, affordable food, and medical services continues in many retaken areas. At the moment, the agency says it has enough rations in the Mosul area to provide food for 2.1 million people for three days, and half a million family rations, which could feed 2.5 million people for one month. Noting that three million people in Iraq have been displaced by conflict since mid-June 2014, WFP says it has food assistance to more than one million vulnerable Iraqis across all 18 governorates. 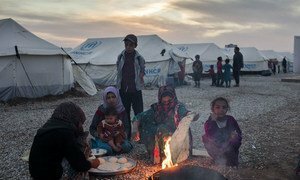 Amid the intensification of the military offensive against the Islamic State of Iraq and the Levant (ISIL/Da’esh) in Iraq’s Mosul city and the resulting displacement of civilians, the United Nations human rights wing said today that it has received reports that Iraqi civilians are also fleeing into Syria, which itself is reeling under a five-year long conflict that has displaced millions of Syrians and left hundreds of thousands trapped in besieged cities.